Sometimes I get lazy... I don't want to leave my bed, I don't want to blog and I certainly don't want to do my hair, but I don't want to go outside looking a hot mess either. Anyone with me on this?! 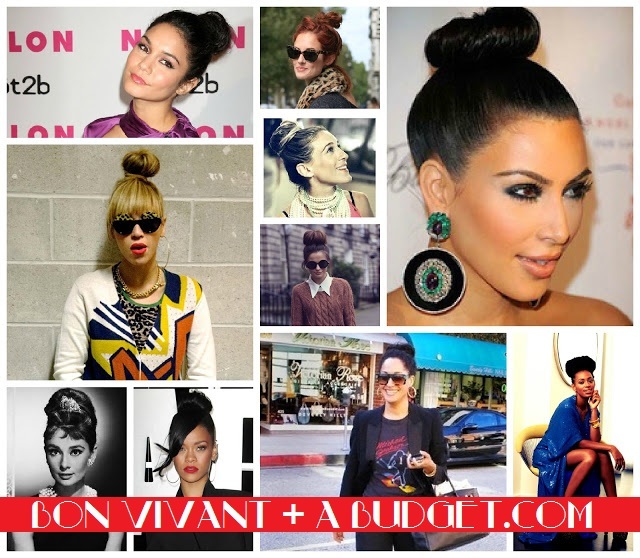 Enter the topknot, a trend that is exploding in popularity as of late. Beyonce and Solange Knowles, Kim Kardashian, Nicole Richie, Gwen Stefani, Vanessa Hudgens, and Victoria Beckham are only a few of the myriad celebrities sporting the trend. But what on earth is a topknot? A topknot is simply a really high bun. To create this hairstyle you only need a couple of hair elastics and your hair gathered on top of your head.... trust me it's really easy to do. That simplicity means it's not going to cost us common folk a month's salary to be on trend and it doesn't take hours to do either. The topknot looks good on straight, curly, braided and even dread-locked hair. And in even more good news... it's versatile enough to go to the office, the classroom, the mall and even the gym. How are you wearing your hair lately? Leave your comments below. ahh, I love the top knot - would love to be able to do it with my hair! I used to have the cutest topknot on my shih tzu. I have since elected to cut him short, but I love the topknots! The one thing that I can say to you is practice makes perfect. I remember the first few times I tried the topknot, it looked pretty dumb and it was crooked. However, after a lot of practice, the knot started looking pretty darn good! Also, use some scissors to clip the rubber band, instead of trying to pull it out. This will prevent knots and prevent you from pulling hair out. Just pick the cut pieces out with your fingers, then comb out the knots.